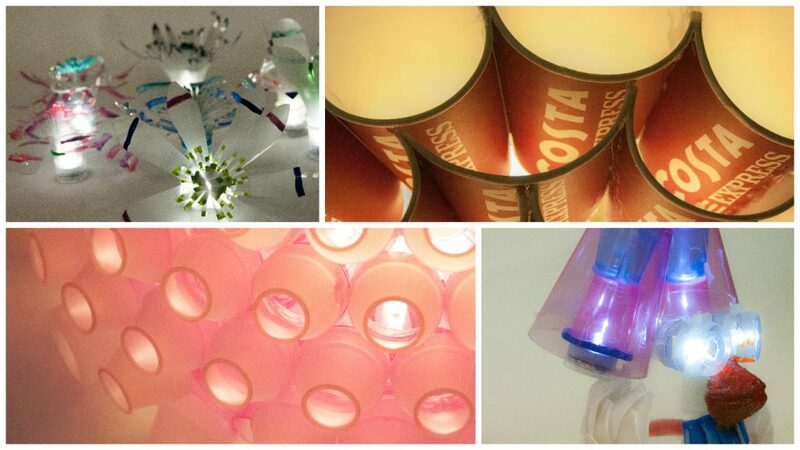 As part of City Arts’ Express Yourself programme, young people from Mansfield have worked with eco artist Sarah Turner to produce a stunning new exhibition of upcycled illuminated scultptures created from disposable cups and bottles. The Under 25s group, which meets at Mansfield Library, offers support and workshops for young people, aged 16-25, who are struggling with stress, anxiety and depression. The group provides a place to work through and share experiences and it is run by qualified counsellors and peer mentors to help improve young peoples’ lives in a confidential environment. Whilst creating the work, the group were inspired by the need to demonstrate how much waste companies are making. It highlights the importance of reusing, recycling and upcycling waste. City Arts’ Express Yourself programme offers to young people in Nottingham and Nottinghamshire the opportunity to gain skills and qualifications whilst raising their self-esteem in a safe creative environment. ‘enLIGHTenment’ can been see at Mansfield Central Library (Mansfield, NG18 1NH) until the 4th of February 2017. Sarah Turner is an eco artist and designer who upcycles waste materials into new and beautiful creations. She works mostly with plastic bottles and cans, transforming them into unique lighting, pictures, sculptures, flowers and gifts. Sarah’s commissions have included a plastic bottle elephant, a recycled dragon, a life sized WW1 tank and an illuminated plastic bottle family. For the London 2012 Olympic Games, she was commissioned by Coca-Cola to create five giant chandeliers and a 9 metre high sculpture for the Olympic Park.